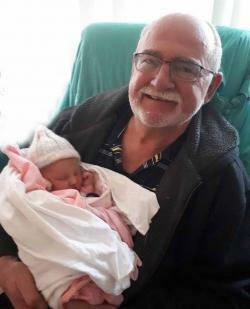 Russell (Russ) Daniel Nixon, 74 of Moncton passed peacefully in the early morning hours of April 12th, 2019 surrounded by his loving family following a lengthy illness. He was born to the late Russell and Thelma Nixon of Nictaux, Nova Scotia and was raised there with brothers Philip and Shirley. He married Gloria Longmire of Hillsburn, Nova Scotia on August 8th, 1970 and they raised three children, Scott, Patti and Cory in Stoney Creek, New Brunswick. Russ was a graduate of DeVry Institute of Technology in Toronto where he completed a diploma in Electronics Technology in 1964 and went on to work as a technician with Addressograph Multigraph International until his retirement in 1993. He served his country as an Auxiliary Member of the Royal Canadian Mounted Police for more than 20 years and served as a Cub and Scout Leader for many years. He proudly held an Advanced Amateur Radio Operator license and went by the call sign VE9RN, was an avid geocacher going by the handle rustyandglobug, was very interested in his family genealogy and history of Nictaux, Nova Scotia and the surrounding area and could crochet like nobody’s business. Russ is survived by his wife Gloria, son Scott, daughter in law Merriam and grandchildren Liam, Gwyneth, Eleanora, Oliver, Heidi, and Flossy of Lake Charlotte, Nova Scotia, daughter Patti, grandchildren Abby (Nick), Hailey and Logan and great granddaughter Lexie of Riverview, New Brunswick, son Cory, daughter in law Dee and granddaughter Dacia (Ben) of Moncton, New Brunswick, brothers Philip (Mariette) of Hammonds Plains, Nova Scotia and Shirley (Linda) of Kingston, Nova Scotia and several nieces and nephews. He was predeceased by his parents and infant sister Sharon. The family wishes to thank Dr. Tom Laughlin for his many, many years of care and support and acknowledge the outstanding care provided by the nursing staff of the orthopedic, oncology, cardiac and palliative care units of the Moncton Hospital over the past 26 years. Visitations will take place at Fergusons Funeral Home, 1657 Mountain Road in Moncton, New Brunswick (858-1995) from 2:00 to 4:00 pm and 7:00 to 9:00 pm on Tuesday, April 16th, 2019. A funeral service officiated by Reverend Colin Cook and Reverend Ed Shaw will take place at the same location at 2:00 pm on Wednesday, April 17th, 2019 with a reception to follow. Interment will take place at a later date.